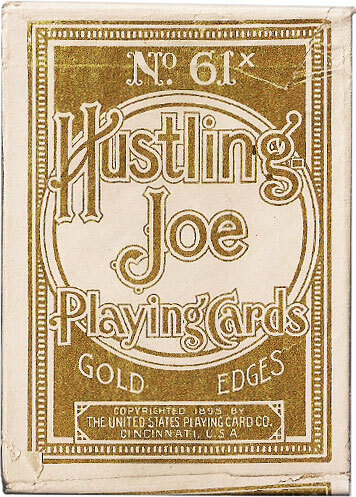 Hustling is the deceptive act of disguising one's skill with the intent of luring someone to gamble with the hustler, as a form of confidence trick. 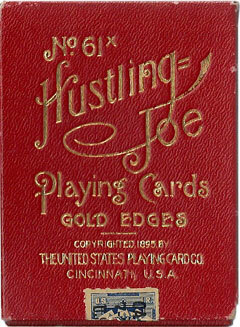 Hustling Joe himself appears on the Ace of Spades dressed in red. The Joker may be an accomplice in the scam. 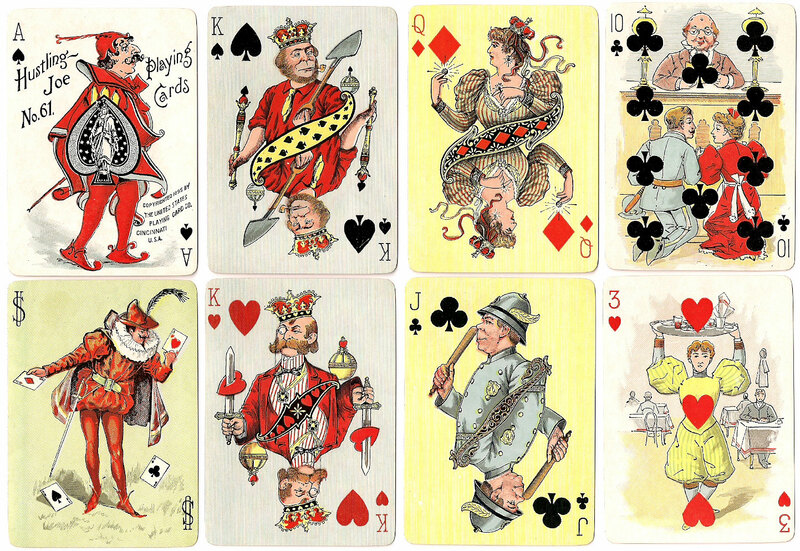 The non-standard and slightly comical court cards have different coloured backgrounds in each suit, and each pip card features a unique and amusing scene which tells a story. But this is not quite a Transformation deck in the true sense as the pips are not properly integrated into the designs. 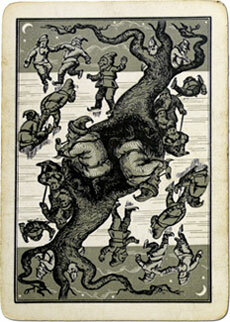 Nevertheless the cards have a certain charm which would have appealed to children if not to serious card players. 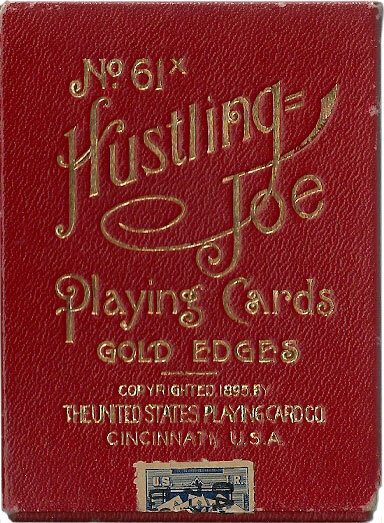 Above: the first edition of Hustling Joe No.61 published by the United States Playing Card Co, Cincinnati, Ohio, 1895. 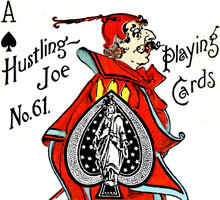 While in the first issue of the deck his costume as seen on the Ace of Spades is red, a second edition was immediately issued to correct some design flaws found in the first edition and his costume was changed to yellow. 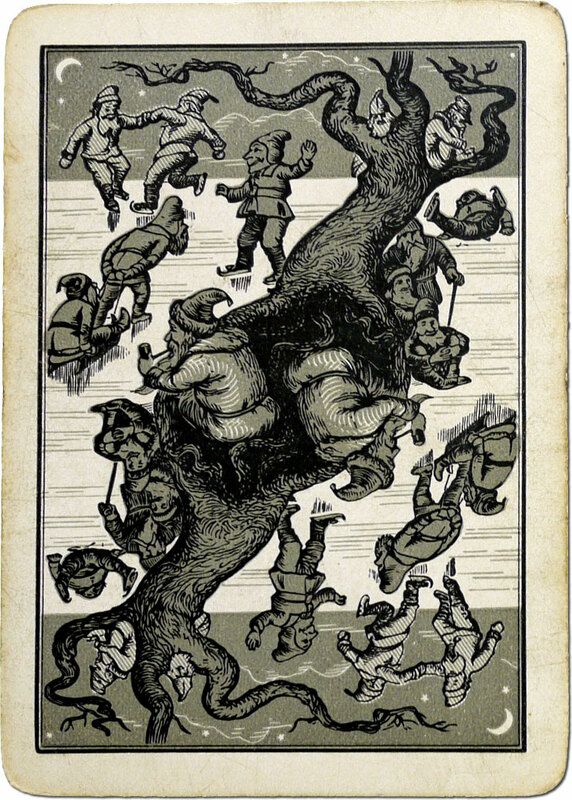 The back design is a double-ended black and white scene of gnomes ice skating in the moonlight. 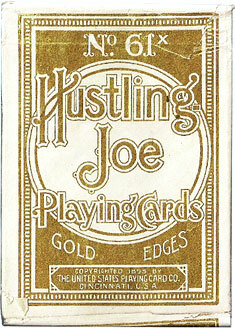 The wrapper is printed in gold, and the deck has gold edges, as stated on the box. All images courtesy Rod Starling. All images on this page are from the collection of Rod Starling, author of "The Art and Pleasures of Playing Cards", available on Amazon.